I recently finished studying and painting my way through Elizabeth Kincaid's book, Paint Watercolors that Dance with Light. Elizabeth Kincaid writes clearly and inspiringly about composition, color, light and shadow. The book doesn't have many step-by-step lessons and is not geared towards the beginning watercolors student. But the book does beautifully show Elizabeth's process and how to apply it to one's own work. This book is inspiring without being intimidating. 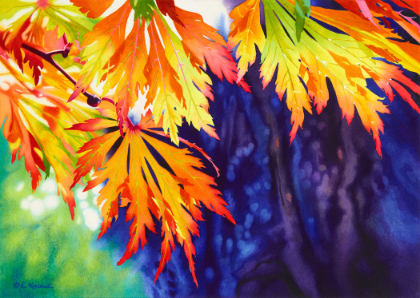 Paint Watercolors that Dance with Light primarily outlines techniques for masking and glazing watercolors and offers plenty of examples of Elizabeth's dazzling realistic paintings drenched in color. Elizabeth's work has strong, saturated, bold color, which I love. But even if you prefer the softer world of neutrals or have a looser painting style, this book offers great tools to explore. In addition to the focus on masking and glazing, Elizabeth gives tips on color mixing, value studies, composition and finishing touches. I recommend this book to anyone who has an interest in exploring the magic of light, color and shadow in their watercolors . Elizabeth Kincaid's work is on exhibit until April 27 at Tsuga Fine Art, downtown Bothell. Her book is available for purchase there as well.